The organizer of the days of activity is the informal public organization "Russian Telegraph Club" (Russian CW Club, R-CW-C). Chairman of the club's council is Stepanov S.B. (RM4C). Date of establishment of the club: October 22, 2010. The site of the club http://rcwc.ru/. To organize the days of activity, an organizing committee is formed. The membership of the organizing committee is formed from the members of the club's council and published on the club's website. Radio amateurs all over the world are invited to participate in the days of activity. During the event the radio station of the Russian Telegraph Club R4CP / 6 (RCWC # 1000) will be active on the air. Also during this period, amateur radio stations - members of the club R-CW-C (activators) will be on the air. The number of activators is not limited, any member of the club at any time of the marathon can become an activator and make his contribution to the event. Obligatory condition is to submit your log for downloading to the R-CW-C site. 3.1 Celebration of the the 8th anniversary of the establishment of the Russian Telegraph Club. 3.2 Popularization of amateur radio communication with the help of the code Morse. 3.3 Let the opportunity to radio amateurs all over the world to fulfill the conditions of diplomas and receive memorable awards, and activators to improve their skills. The introduction into the daily work of radio amateurs on the air a competitive component. The terms of the diploma programs of the days of activity are given in paragraphs 7 ... 9 of this document. Days of activity are held since 00.00 Moscow time October 16 till 23.59 Moscow time October 22, 2018. During the days of activity amateur radio stations - members of the club R-CW-C (activators) will be on the air. Type of modulation - CW. The format of the general call is CQ CALL ... CQ CALL RCWC. Each member of the club R-CW-C, who wants to become an activator, must notify the organizing committee by e-mail rm4c@mail.ru. The current list of activators is published on the club's website. Activators are required to send their LOG daily to the organizing committee for filling into the rcwc.ru website. The production and distribution of the required number of QSL cards through the QSL-Bureau of the SRP is carried out by the activators at their own expense and on their own. The production and distribution of QSL cards of the club radio station R4CP / 6 (RCWC # 1000) is carried out by the organizing committee of the marathon centralized due to voluntary donations of members of the club. 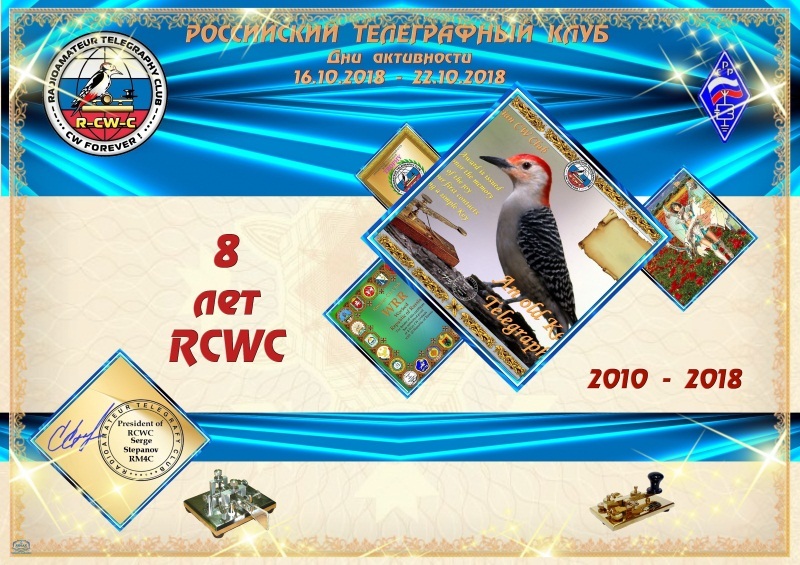 The diploma programs are timed to the days of activity devoted to the 8th anniversary of the establishment of the Russian Telegraph Club (R-CW-C) and include two separate diplomas: "8 years of RCWC" and "With Telegraph Forever! ", As well as a special pennon "8 years of RCWC". - ending: October 22, 2018 (23:59 Moscow time). Bands: 10, 12, 15, 17, 20, 30, 40, 80, 160 meters. 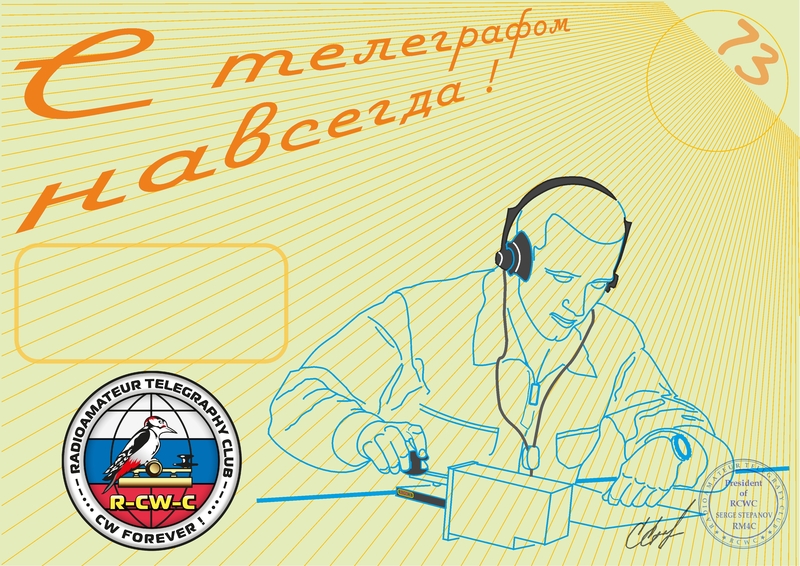 During this period, the radio station of the Russian Telegraph Club R4CP / 6 (RCWC # 1000) and amateur radio stations - members of the club R-CW-C (activators) will be active on the air. Diplomas are free, given to hams in electronic format. To organize the activators work during the days of activity and automated download of the completed diplomas, the RCWCLOG service operates on the RCWC.RU website. Activators at the end of each session on the air fill their logs in the database of the service within 24 hours. Repeated radio communications: (Worked + Call + Band coincidences) are tracked at the time of filling and automatically deleted by the ROBOT, leaving the first connection in date and time. Note: Communication with an activator radio station operating in special conditions and having an optional fractional part (/ M, / P, / QRP) in its callsign is counted as a connection to the callsign without this optional fractional part, ie R4CP / 6, R4CP / 6 / M, R4CP / 6 / P - in the telegraph marathon are considered one callsign and are entered in RCWCLog as R4CP / 6. Accordingly, R4CP / 6 and R4CP are two different callsigns. Logs are available for viewing to all radio amateurs both registered on the site and to the guests of the club as well. Each applicant can at any time, see the statistics of each activator, check the records loaded into the database about all or only about their QSO, check the fulfillment of the terms of the diploma programs by entering their callsign in special query windows. When the request is received, the RCWCLOG service checks the QSO in the database and checks the fulfillment of the conditions of the diplomas for the entered callsign. The result of the check is displayed in the form of a table. If the conditions are met, the diploma becomes available for download (the diploma "8 years RCWC" is available for download at the end of the whole event, and the diploma "With the Telegraph Forever" as soon as its conditions are met). With each new filling of any log in the service base, the tournament table of activity days is automatically generated, the task of which is to allocate seats among the participants at the current time. The RCWCLOG service interface is intuitive and does not require additional explanations. The rules of the service can be found on the club's website. 8 The principle of distribution of seats in the standings and the conditions of the fulfilment of the diploma and the pennant "8 years R-CW-C"
4 At an equal number of credit QSOs (points) and an equal number of activated callsigns, the applicant has the advantage if he has conducted his QSOs on more bands. 5 If all the conditions listed in clause 4 (equal to QSO, Calls and Bands) are equal, the applicant has the advantage, if he has shown his result earlier (time of the last credited QSO). During all days of activity, the current tournament table is available for viewing on the RCWC Log service. At the end of the event and the last filling of the log into the base, the standings are fixed and the winners and the final number of holders of diplomas and pennants "8 years old R-CW-C" are determined. A diploma is issued for no less than 8 QSOs, and a pennant for conducting at least 15 QSOs with any activators. Numbering of diplomas and pennants - according to the occupied place in the standings after fixing it at the end of the event. Note: SWLs wishing to receive diplomas should send an application in free form to the diploma manager on E-Mail: rm4c@mail.ru. 9 Conditions of the fulfilment of the diploma "With Telegraph Forever!" 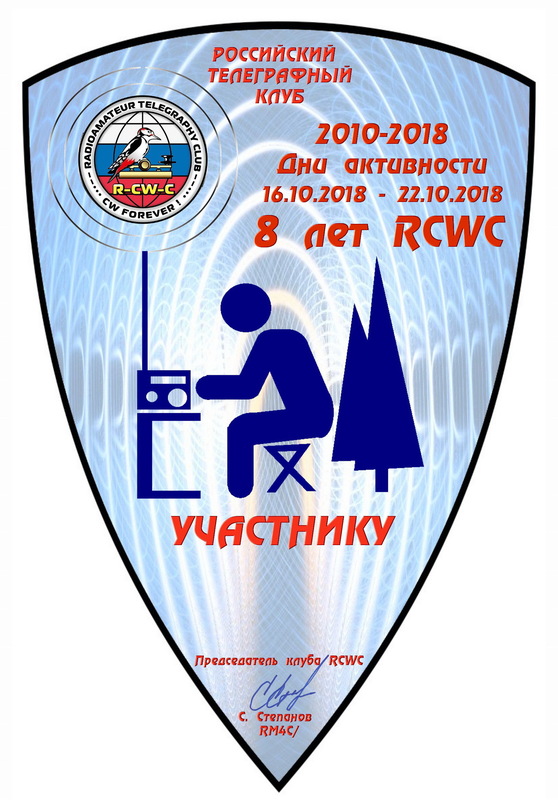 The diploma is issued for conducting no less than 3 QSOs with the radio station R4CP / 6 during the days of activity devoted to the 8th anniversary of the establishment of the Russian Telegraph Club (R-CW-C). The diploma is free and issued in electronic format to all radio amateurs of the world who have fulfilled its conditions. You can check the progress of the fulfilment of the conditions of the diploma on the RCWC Log service of the RCWC website. If the conditions of the diploma are fulfilled by the competitor, then the function of automatic diploma downloading is activated for him. GENERAL PROVISIONS OF DIPLOMA PROGRAMS "Telegraph Marathon R-CW-C - 2018"
Regulations on the Days of Activity "Telegraph Marathon R-CW-C - 2018"